Two years ago last weekend I was in New York City at the World Maker Faire and although I had been once before at the inaugural Montreal Mini Maker Faire it was still like the very first time. At this point I have been to four and have some thoughts on what keeps Maker Faires a terrific experience. Keeping it well organized; Even simple logistics can make the difference. The visitors will always have a good time. If things run smoothly they will have a great time. Keeping your volunteers and makers happy; The visitors will be happy if the people they are interacting with are happy as well. Having variety; Variety gives the visitors, obviously, a more varied experience. More importantly it communicates the message that MAKING can mean many things. For the maker movement to thrive it needs an image that appeals to the widest variety of people. 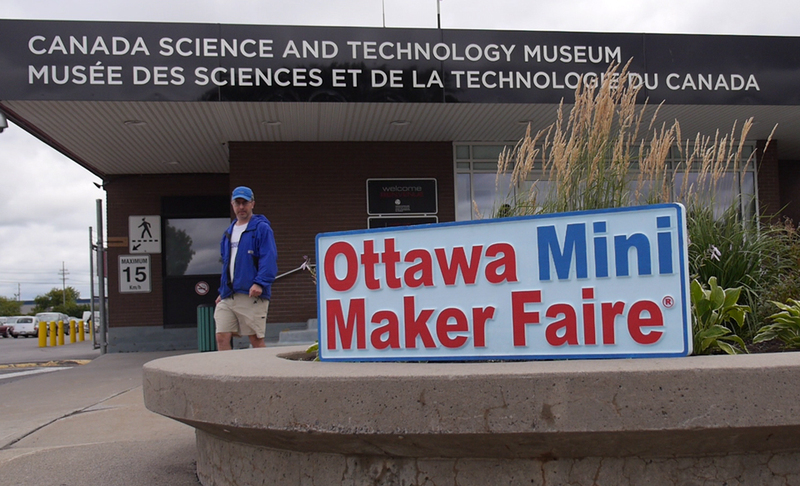 A perfect (“ideal” is a better word) marriage was consummated on August 16 and 17, 2014, when Artengine and the Canada Science and Technology Museums Corporation co-presented the fourth annual Ottawa Mini Maker Faire at the Canada Science and Technology Museum. Artengine is an Ottawa-based collective of artists, technologists and interested members of the general public with strong ties to the local, national and international community of technologically-based artists. By partnering with the Canada Science and Technology Museum Corporation, it is in a practical and symbolic way bringing two worlds together with the sole objective of celebrating and showcasing MAKING. The museum was a good setting for another reason. Some of the technologies on display at OMMF were pretty advanced. It was opportune that one could learn the history of that same technology by stepping out of the maker rooms and into the rest of the museum. This entry was posted on Tuesday, September 23rd, 2014 at 5:13 pm	and is filed under Musings. You can follow any responses to this entry through the RSS 2.0 feed. You can leave a response, or trackback from your own site.